This most interesting surname is a patronymic (i.e. son of) from "Addy", a pet form of Adam, hence the name means the "son of Addy (Adam)". Adam, itself widespread in England and the Continent, derives from the Hebrew personal name "Adam", which was borne, according to Genesis, by the first man. It is said to be of uncertain etymology, but may come from the Hebrew word "adama", earth, and was very popular as a personal name throughout Europe during the Middle Ages. 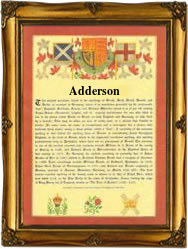 The surname itself dates from the early 14th Century (see below), and one Robert Addeson appeared in 1498, in the Register of the Guild of the Corpus Christi in the City of York. On February 16th 1623, one Thomas Addison was recorded as living in Elizabeth Cittie, Virginia, being one of the earliest settlers in the New World. Matthew Addison, aged 17 yrs., arrived in September 1635, at St. Christophers in the Barbados, having sailed from London on the "William and John". One Joseph Addison (1672 - 1719), distinguished as an essayist, poet and statesman, formed friendships with both Jonathan Swift and Sir Richard Steel as well as many other writers of this era. He worked as secretary to Wharton, Lord Lieutenant of Ireland in 1709. The first recorded spelling of the family name is shown to be that of John Addisone, which was dated 1308, in the "Calendar of the Patent Rolls of Yorkshire", during the reign of King Edward 11, known as "Edward of Caernafon", 1307 - 1327. Surnames became necessary when governments introduced personal taxation. In England this was known as Poll Tax. Throughout the centuries, surnames in every country have continued to "develop" often leading to astonishing variants of the original spelling.